I was born and brought up in the beautiful country of Tanzania situated in East Africa.Though I might be an Indian..that african impact is always there deep down within me…be it the way I think..the way I cook…or almost everthing else..!So today I bring an African dish to you! !Pumpkin Chapathis! Tanzania is a kind of mini India…there is a humongous population of Indians..Gujaratis,Punjabis etc settled here from generations..their presence have had a huge effect even on the local cuisine.One such dish or street food as we foodies put it is the Pumpkin Chapathi..The first time I had it..I was totally blown out..It has got this exceptional taste..a little bit sweet…a little bit salty…!I like to have this with a little extra spicy side dish…All flavours on the go!!! Cook the diced Pumpkin with a little water(lid closed) until soft and easily mashable.After cooking,allow it to cool down. Puree this cooked pumpkin in a blender and keep aside. 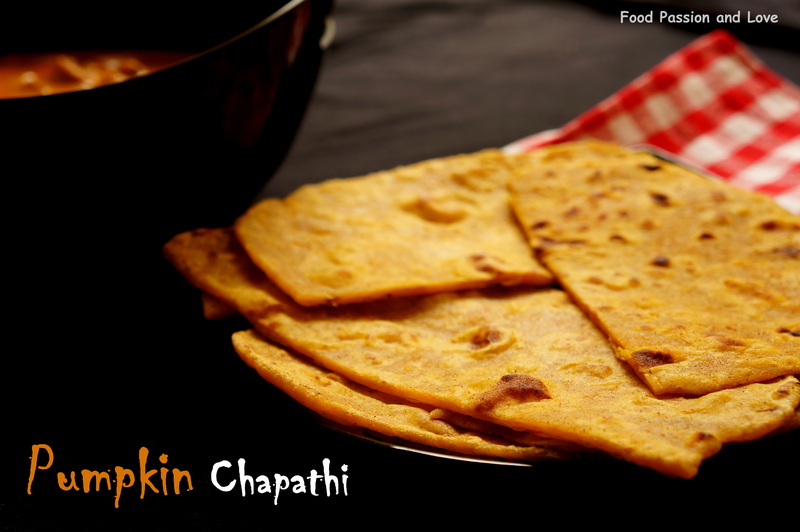 In a big bowl,add the flour,salt,Pumpkin puree,oil and knead with clean hands.If needed add a little water and knead into smooth chapathi dough consistency. Cover the dough with wet cloth and leave aside for 20 minutes. After this,knead the dough again and divide and roll into small balls.Dust the balls with some flour to avoid sticking on the surface. Flatten each ball and roll out thinly into sizeable circles. Heat an ungreased, heavy skillet or griddle over a medium flame. Lightly grease the pan and slowly heat the first chapati. Cook on one side for about 1 minute or until lightly brown, then flip and cook the other side. Press the sides of the chapati with a spoon until it puffs up. Remove and transfer to a hot casserole or wrapped up in a foil paper to keep warm. Repeat similarly for all other balls. Serve with some spicy vegetable or Meat curry and Enjoy!! This entry was posted in Uncategorized and tagged african cuisine, african street food, chapatis, Pumpkin, pumpkin chapathis, street food, Tanzania. Basil seeds are also known as sabja seeds,sweet basil seeds or even as tukmaria seeds…These seeds have a wonderful property of welling up when soaked in water for about 5 minutes…It becomes jelly like…and is quite crunchy with no taste of its own..however one must not underestimate these little guys as they consists of a huge bundle medicinal properties..like being a natural laxative…a natural coolant and even also known to cure urinary tract problems..! P.S – FOOD PASSION AND LOVE is now on instagram too!Catch me at FOODPASSIONANDLOVE in instagram. In small bowl soak up the basil seeds in 1/2 a cup of water for about 5 minutes. Squeeze the lemon into a pitcher and add the chilled water,sugar/honey and salt and stir till sugar is dissolved.Now add the soaked,welled up basil seeds. Pour into tall glasses .Serve..Enjoy!! You can replace sugar with honey for a healthier option. If the Basil seeds settle to the bottom,just give it a stir before serving! 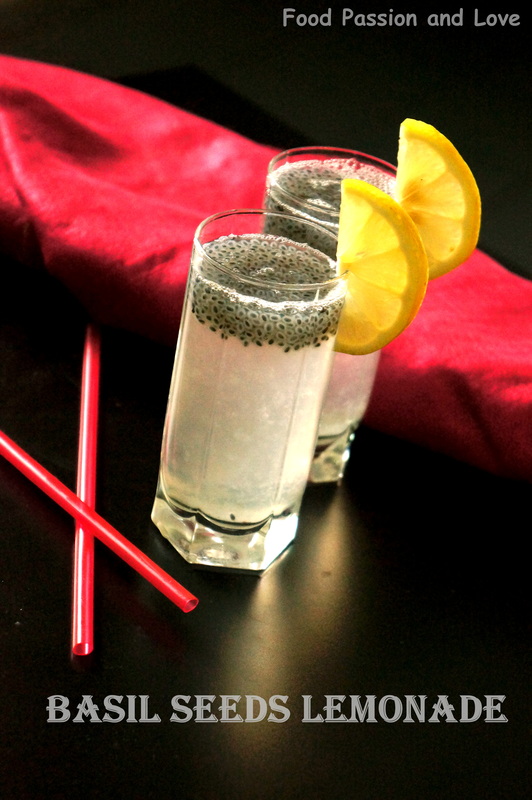 This entry was posted in Uncategorized and tagged Basil seeds, easy summer drinks, honey, lemon, lemonade, lime, sabja seeds.